Track condition is one major variable in Australian horse racing with almost 15 different categories adding that extra layer of veneer to the overall selection process. Paul Segar and Pureform cover some aspects of the various track conditions available throughout Australian horse racing and is updated for track changes in December 2014. As everyone knows, Australian horse racing is run each and every day of the year (excluding Good Friday and Christmas day) on a variety of racing surfaces with meetings undertaken all around this mighty country – most races are run on grass racing surfaces that are maintained by track specialists at each and every location. Grass racing surfaces vary in their racing condition and as a result makes racing that interesting, fickle and at times exasperating pastime that you can at the same time both love and hate! Variations in track condition are a major part in this love/hate relationship and this article attempts to delineate some of the major differences along with some advice towards the best/worst opportunities. As always general comments are just that, general and will not apply in all situations. Now why is the track rating so important? Simply because many horses perform differently on the various racing surfaces. In Australia (and all around the world), there are basically two types of racehorse when talking about grass tracks: the dry tracker and the wet tracker with most horse preferring one or the other racing surface. ***Understanding which racing surface best suits each horse is of prime importance in an overall selection process. The new system of 1 through 10 track condition ratings was implemented in the mid 2000’s and updated at the end of 2014 replaced the older system of simply Fast, Good, Dead, Slow and Heavy. The new system is more descriptive and provides a better idea as to the likely track condition. It is far better than other terms such as holding, soft, cuppy, muddy, sloppy, etc. and gives a real answer, a number, to quantify the likely track condition. Track ratings for grass tracks as of December 2014 fit into the system as shown below and have been modified, for better or worse from an older system which is also discussed. This new system is, as always with any major change, going to be confusing for the first period of time as formguides will still show results using the older system. Grass track rating names are fairly self-explanatory. Races run on a firm 1 (previously fast 1) track are just that - fast. The horses scoot along with front runners generally favored. There are very few races run today on a genuine Firm 1 track rating and so this rating can be more or less ignored. The same general speed comment applies to a Firm 2 racing surface which is more or less equivalent to the old Fast track rating from yesteryear (and equivalent to the old Fast 2 prior to December 2014). These first two track ratings put tremendous pressure on racehorse joints and bones with many horses injured or performing poorly as a result of the ‘concrete’ racing conditions. ***There are very few ‘iron’ horses that consistently perform well on these two track ratings with a Firm 2 track favoring fast performers. Good 3 is the next rating in terms of basically the lowering of the speed of a race and increasing the ‘softness’ of the racing surface. A good 3 track has some ‘give’ in its surface and is therefore a better general racing surface for most horses. Race injuries are lessened this racing surface and is the same term as user previously. The next rating, Good 4 is generally more rain affected than a Good 3 but does not greatly enhance the more serious wet tracker’s chances (and equivalent to the old Dead 4 track rating). ***Most horses can still perform well on a Good 4. Generally a dry tracker performs best on ratings 1 through 4 (realistically ratings 2 to 4). Soft 5 can be considered borderline or transitional for both dry and wet trackers. The Good 4 and Soft 5 ratings now replace the rather awkwardly named Dead track rating but is definitely confusing as the dead rating was quite unique from slow and heavy ratings. We as punters can only work with what we have and so be wary of this change. ***Soft 5 is equivalent to the old Dead 5 rating with the numbers now being more important than the name. The last 5 track conditions occur when a track is badly rain affected with increasing times as part of the increase in track rating number. A Soft 6 track favors horses that can handle a wetter track and is considerably different from a good 3 track rating. A Soft 6 track is wetter than a Soft 5 and a Soft 7 is wetter again. Generally the time taken to run the race is increased as is the amount of kickback with every increase in ratings number. ***Some tracks can however be badly rain affected yet display little or no kickback. Horses racing on wet tracks suffer fewer leg injuries but can bleed or suffer other trauma as a result of the increased racing strain. At the bottom of the track rating scale are the three heavy track ratings – 8, 9 and 10 and these remain consistent with the earlier rating system. These three sub ratings are almost separate categories in their racing styles and vary far more than the other good, dead and slow figures –times for heavy track races can increase dramatically with a heavy 10 track condition race times often many seconds slower than for any other track rating. Just to further consider these really wet tracks, a horse can perform well on a heavy 8 track condition and be almost unbeatable as a top wet track performer only to fail abysmally on a heavy 10 and vice versa. A heavy 10 track condition is often described as bottomless and basically favors horses that can handle this racing condition, often described as suiting ‘swimmers’. Drenched heavy track performers are not in any way the sweetheart prima donna sprinters winning in slick time over a short course but instead are tough, strong and fearless. Many jumps’ trained horses out perform in these trying racing conditions displaying the stamina of a marathon runner. Some track ratings are very closely banded. Good 3, Good 4 and a Soft 5 track ratings are all fairly similar with basically the speed of the race being the major difference as the track deteriorates from rain or overwatering of the racecourse. Often the fast horse on a good 3 track is moderated and brought closer to the rest of the field as the track racing surface deteriorates. Most dry trackers handle these three ratings, but there are the exceptions as everything in horse racing. Some horses only perform on a dry track rating and simply slip and slide on anything wetter. Other gallopers need the ‘sting’ out of the ground, but can only handle a soft track and no wetter. Some horses can handle all racing conditions equally but this type of runner is usually the extremely honest campaigner that always tries 100%. Many horses ‘turn it up’ on an unfavorable track condition and most have a preference for wet or dry, but rarely both. Those horses that perform well on all track surfaces probably race in a range of around a 5kg margin with their preferrred track suiting best and the worst maybe 5kg less (around 3 lengths) but in today's racing an astute trainer can place one of these types in a weaker race and still win on a less preferred track condition. Often horses get that wet track win in a maiden and look suited in the wet but actually the horse simply outclassed the field and was a "duffer" in the wet. I remember going to a Kyneton meeting many years ago when on-course bookmakers were the only way for fixed price betting with the plan to back one horse as unbeatable in the last. On the way to the track the heavens opened with the rain at full pelt falling from before race 1 until the 'special' was due to run in the last race. Amidst the doom and gloom of constant rain, the horse I went there to back became less and less the top bet as he was a complete no-hoper in the wet. By race 8, the track would be classified as a bottomless heavy 10 and all hope of the top bet gone. It is crucial to have a solid idea of the track rating at any meeting and one way to achieve this is by using a time at the current meeting from an early race but be wary of muddying the whole process by using times in small fields (a final 600m time is probably more useful at tracks that have sectional times). As most punters know, there are huge differences for horses when moving from a good 2 grass track rating through to heavy 10 grass track with the expected winner usually completely different. Often the likely winner is altered with a mere one rating position change as such is the competitive nature of racing in some states of Australia. Generally wet trackers run well on wet tracks and fail on drier surfaces. Dry trackers generally perform well on a dry track and fail in the wet. Many in form wet trackers on wet tracks can run a solid dry track race or two at the end of the winter months but usually fail after a run or two on drier surfaces. A wetty may fail on a dry track but can still bounce back into form if conditions are suitable but after some time on drier tracks will lose all form. Once completely out of form no amount of rain will improve a wet tracker’s performance, it is probably then a mental issue for the horse, it simply gets used to finishing near the back of the field. Some of the problems with this rating system include the ever present incorrect ratings. Track ratings are often upgraded/downgraded during a meeting especially during the wetter months of the year and as a result adjustments are often needed to selections or a complete re-think of the race/meeting. This may be ok if you are watching the meeting or monitoring the weather closely. It is rather annoying to find you worked out a meeting for a dead 5 track which is now a soft 5 only to find an upgrade after race 3 to a good 3 or alternatively downgraded to a soft 6 when the sun is shining and an upgrade was expected. ***In the middle of a stormy winter it is almost impossible to guess the likely track rating of the next day’s meetings which makes night time study somewhat impractical. Track upgrades/downgrades are often not included in final results with many race results reflecting incorrect track ratings. Consider the runner with one soft track win from 10 starts racing today as a real chance on a soft track in a class one event. The horse’s other 9 dry track runs have been poor suggesting a wet track might be its forte. Change the win from a soft track to a good track due to a track upgrade on the day and in fact its only win and best performance was on a good 3 track rating. The same runner now becomes far less certain on the wetter track as a result of its only win (and not the soft track win as first considered). Chances are it probably fails abysmally on the wet track. Winning races on wet tracks is generally harder than on drier tracks. Many other variations make for interesting figures associated with many past racing performances. Of course the majority of races are accurately recorded for each and every runner but the exceptions often produce that long priced winner or placegetter or that unexpected failure due to a poor track condition. Horses race differently on the various racing surfaces with a potential champion on one racing surface perhaps reduced to a complete duffer on another. There doesn’t appear to be any rule to follow when horses move from one track surface to another other than simply observing the result. ***A horse can be completely useless on any track surface or competitive on turf but weak on a synthetic, sand or dirt track with every other permutation a real possibility. Most sand and dirt tracks are run in remote areas and are limited in the number of either meetings or races each year. Some tracks are part dirt and part turf, an interesting combination. There may be other combinations run in remote locations. Certainly the variations in track surfaces can make for interesting but not necessarily profitable racing. Many synthetic racing surfaces are used during the winter months which then produces a synthetic track ‘form’ pool. Overall it is the usual maxim – horses for courses. Horses racing well on synthetic tracks are often weaker than their turf counterparts and generally shy away from competitive synthetic runners back on turf – horses that perform well on a synthetic track often repeat the good run(s) at some time during its career. Synthetic tracks generally race like a turf heavy track although the times are close to good 3 grass track times. Momentum is often the key to winning on a synthetic track (as is the case on a rain affected track) which is why many front runners are successful when racing on a synthetic surface. Generally lesser quality synthetic track runners finish on less from back in the field compared to their stronger turf counterparts. Synthetic tracks can be affected by the weather, especially windy conditions that can cause kickback and other effects for the various competitors. Some days, synthetic tracks favour front runners, other days, the run on applies. Monitoring the wind conditions can point to the likely racing characteristics. A perfectly still racing day will generally favor front runners. The final track rating is the variable one – that is the track has a different rating at various places around the course, perhaps soft to heavy in parts but dry in the straight, again there is a myriad of possibilities. This type of rating typically occurs when there has been recent heavy rain which has affected some parts of the track more than others. Best decision for this type of racing? Pack your bags and go fishing as the results are often impossible to predict and the results from the meeting nigh on worthless. The age old question with wet tracks is, “How did that horse win by 6 lengths last week on a heavy track and today ran tailed off last in exactly the same conditions?” Like many things, the answer is a pineapple. Most horses racing during the wetter months are of lesser quality than the Spring and Autumn campaigners and so can be inconsistent in their racing style. ***Most winners are forced to carry more weight and run in higher quality events in their next run and this is that extra factor leading to many wet track winner’s demise. The winner in many races gets into a strong position and takes the ‘gun run’ carrying the light weight only to be given no favors at the next start with more weight and a traffic jam. In the first run, the horse takes up a spot only a few lengths off the lead. At its next start, a slightly tardy beginning due to the higher weight and a prat at the start finds the same horse six or more lengths off the pace. Net result, it loses sight of the ‘bunny’ and remains in a rearward position throughout. Small variations in running can add up to some huge result differences and can have the same horse struggling at the rear of the field along the fence instead of steaming home a three length winner down the outside rail. Race times often tell the tale on a wet track but times can become difficult to interpret. Did the track deteriorate with rain or racing? Is a faster time in the first race actually faster than the slower time in the last race? And so on. Generally if race one is run a second or more faster than race two, then race one is the stronger race. All the usual rules apply to wet tracks as they do for dry tracks – just harder sometimes to interpret correctly. Horses often change their racing habits as their racing career matures. Some horses have been successful on a wet track as a 2yo and yet cannot get ‘warm’ on the same condition later in life. Often 2yo races are run on wet tracks with not a single runner handling the track condition. In the end, something wins the race and might have even looked good winning; the same applies in many other events. Many horses have therefore won on a totally unfavorable track rating but looking at their stats can appeal as a superior wet (or dry) tracker (figures can be inaccurate as per the Class one earlier example). This further muddies (excuse the pun) the problems when using consistency figures as a guide to future performance. Generally ignore wet track form from more than a few years ago and discount those early 2yo runs when dealing with older horses. Horses that perform well on wet tracks often have a series of consistent wet track performances and not simply one early wet track success. So after all this discussion, which are the best track ratings to bet on? ***Almost certainly firm 2 or good 3 tracks are the best racing surfaces giving most horses an even-run. This even-run means that most of the form will ‘hold up’ as best it can. A good 3 racing surface effectively moderates the track rating as a major player in race selection and in most cases eliminates the strong wet tracker as a chance (the wet tracker is usually just too slow to get into the event). Most other track conditions will favor some runners over others and the preferred runners will vary depending on this rating and so a greater knowledge or understanding of those preferred track ratings is crucial. This simply adds that extra layer of veneer to the whole process which given a clear track rating can be quite good for punting. The whole process can become almost impossible however given an uncertain track rating. Certainly some horses racing on a heavy 10 track condition are almost unbeatable but to select those horses often requires intimate knowledge about wet track performers and a clear and correct track rating. 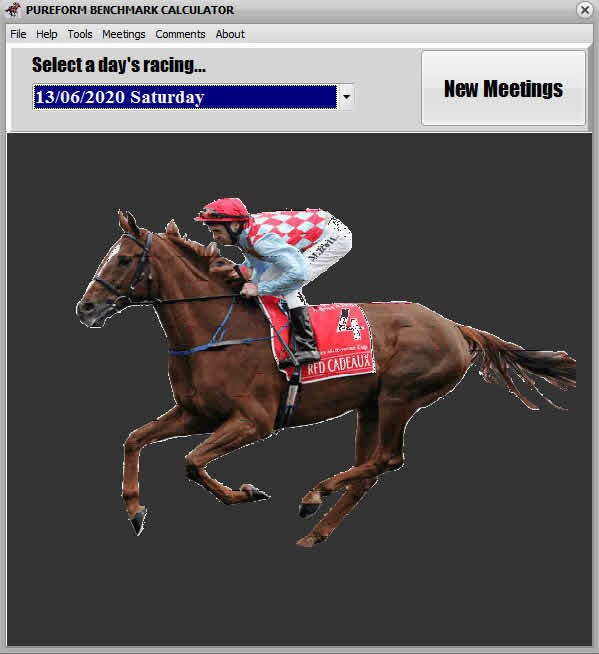 As always, information is power and the punter with the best information is positioned to not only make better selections but also avoid obvious losers. Generally avoid wet tracks unless you have strong knowledge about the horses running under those conditions and adopting a policy of betting on the driest track for the day is usually the best positive approach. As to that race at Kyneton and the "special" in race 8, of course the horse was a complete duffer in the wet and at no stage was comfortable in the going but despite all these difficulties and on the wrong leg the whole way won the race by 5 lengths at odds of $6. It just outclassed its rivals and sure ran 5kg worse than its best (probably 20 kg worse) but that was still enough to beat the others. As they say, nothing in life is certain, except death and taxes... and Black Caviar.